Exclusive to lubricant marketers in the Oil & Gas Industry, we provide inside sales and customer care as a value-added service. You don’t necessarily have to use Ledgeview’s CRM product to benefit from it, but it certainly helps. Not sure where to begin, or if creating an inside sales program at your company will be effective? No problem! We start by identifying your account dynamics and developing a contact strategy. From that, we will work with you to establish customer goals which will ultimately determine the workload requirements. Our experienced team at Ledgeview Partners will help you implement and structure an efficient and effective customer care inside sales program at your company that produces results. We will set up the process, recruit talent, hire them and train new sales professionals who will work at your local office. Tight on office space? Inexperienced with effectively overseeing an inside sales program? A popular option is to let a dedicated member of our inside sales customer care team serve as a direct extension of your company. 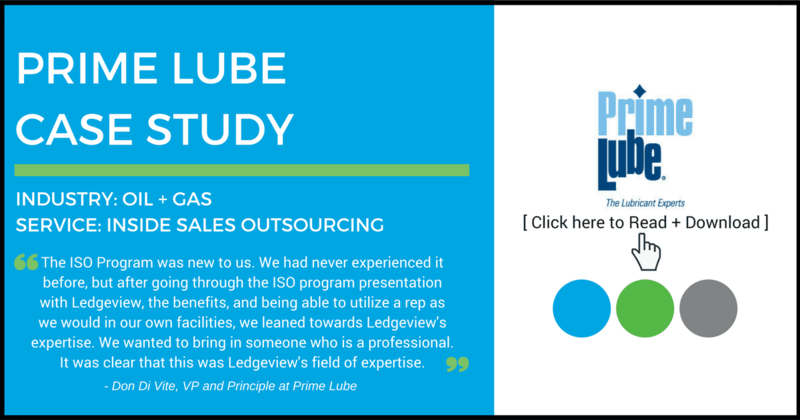 With your inside sales force operating remotely out of our Ledgeview customer care center, you will benefit from our expertise and lower overhead costs while maximizing your reach and increasing your market share. In this webinar for Chevron Lubricant Marketers, you will learn best practices to establish a successful inside sales program that can help create a more efficient sales organization, increase gross profit and grow Share of Wallet business with your customers.